During the 2000 Oktoberfest in Munich..., at the Rathaus (town hall) there were very long vertical flags (about 6:1) of Bavaria, Germany and Munich. Unofficial, but the private use is permitted. The shield Federal Shield (Bundesschild) on the state flag has a special shape, not the same as in the coat-of-arms, although on flags used "illegally" by sports fans this shield often totally resembles the coat-of-arms. 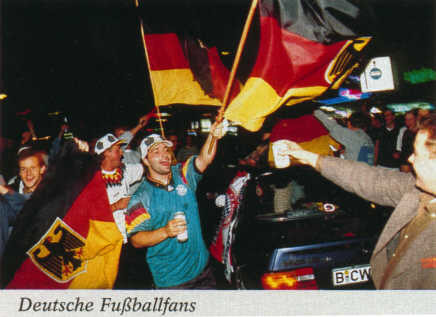 Issue 13 (26th March 2001) of the German weekly news magazine Der Spiegel, p. 6, showed a picture of German football fans waving that unofficial variant of the German state flag . I have reported more than once on the very frequent display of the German flag upside down in Spain, most notably at tourist resorts, but also elsewhere. Well, even here in Germany such things happen. I frequently pass by a restaurant in a little village, where they have oblique flagstaffs at the wall. The German flag is upside down there. Interesting story about erroneous German flag from Jens Wilke. He wanted to draw attention to a humorous story that happening in Germany. One of the top news shows on German TV did a report on the 2008 European Soccer Championship. In that report, the editor must have been very absent-minded and messed up the German flag. Instead of black-red-gold, he accidently "created" a new one, red-black-gold, very much to the embarrasement of the news company. Some soccer-fans apparently took up this idea and actually made a real flag like it, and went to the big public-viewing events, looked for the reporters and waved this "new" flag in the background, so it was - again - in the same news! This is edited from my articles in the German Wikipedia. In the past couple of years an unofficial variant of the German flag appeared with the Turkish Crescent and Star in the red stripe. It is mostly used by people of Turkish background living in Germany. I saw it in Munich and I've been told that it also appeared in Hamburg. It was seen at the European soccer championship in Basel/Switzerland (Germany vs. Turkey), and is in use by media too, for example, in one of Germany's most popular magazines, the "Spiegel". The creator of the flag was Behcet Algan, who called his flag "Deutürk-Fahne". His original flag is on display at the Hamburg Völkerkunde Museum. The flag symbolizes the solidarity to the second home of Turkish people in Germany. It is interesting the strong emotions this flag generates. When I added this flag to my German Wikipedia articles, some said this flag was defamatory, others didn't accept it as relevant, and others called this flag a symbol of a Turkish occupation (?) of Germany. Thank goodness, these opinions are in the minority. I think, this flag symbolize a beginning integration of Turkish immigrants in Germany. Only 10 years ago they only raised Turkish flags, and never any German symbols. It is not a German flag, but most probable a variant of the Native American Seminole Nation or Miccousukee tribe in Florida.